Preheat oven to 350 Degrees F. Place Chicken breasts in a shallow baking pan. In a skillet, saute onions in olive oil until tender. Add apples and saute for 1 more minute. 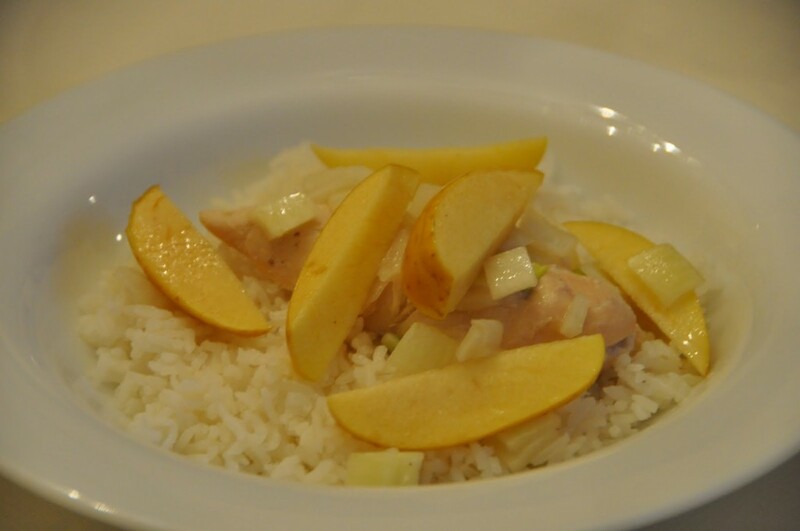 Pour onions and apples over chicken. Melt Butter substitute and pour over chicken and add apple juice, honey, salt, and if you want to add any other vegetables you can. I usually cook some vegetables separately as not to affect the flavor of this dish. Bake in the oven for 30-45 mins or until chicken is cooked through. This dish tastes best when prep work is completed and the dish is allowed to marinate for a while in the fridge before placing in the oven to cook. I usually will steam up some white Jasmine rice or brown rice to go with this dish. Serves 6. Enjoy!